Σεισμική δόνηση μεγέθους 3,9 βαθμών της κλίμακας Ρίχτερ σημειώθηκε στις 19.36 κοντά στο Κιλκίς, σύμφωνα με προκαταρκτική εκτίμηση του Γεωδυναμικού Ινστιτούτου του Εθνικού Αστεροσκοπείου Αθηνών. Φυσιολογική χαρακτήρισε τη σεισμική ακολουθία που επικρατεί στην περιοχή του Κιλκίς, μετά τον σεισμό των 4,7 της κλίμακας Ρίχτερ που σημειώθηκε στη 1.22 τα ξημερώματα, καθώς έχουν σημειωθεί -μετά από αυτή την ώρα- αρκετοί μετασεισμοί ακόμη και 3 βαθμών της κλίμακας Ρίχτερ ο καθηγητής Γεωφυσικής του ΑΠΘ, Κώστας Παπαζάχος. Σεισμική δόνηση μεγέθους 4,8 βαθμών της κλίμακας Ρίχτερ σημειώθηκε στη 1:22 στο Κιλκίς. Ειδικότερα, σύμφωνα με το Γεωδυναμικό Ινστιτούτο Αθηνών, τo επίκεντρο του σεισμού εντοπίζεται 18 χλμ. δυτικά του Κιλκίς. Ομαλά εξελίσσεται η επιχείρηση εκκένωσης της Ειδομένης από τους πρόσφυγες που ξεκίνησε νωρίς το πρωί. Τα πρώτα 13 πούλμαν με 609 πρόσφυγες έφυγαν από τον καταυλισμό και κατευθύνονται σε οργανωμένες δομές φιλοξενίας στην ευρύτερη περιοχή της Θεσσαλονίκης. Ως «απαράδεκτα» χαρακτήρισε ο υπουργός Εξωτερικών της Αυστρίας, Σεμπάστιαν Κουρτς, τα «περιστατικά βίας» από τη μεριά μεταναστών κατά των δυνάμεων ασφαλείας της ΠΓΔΜ, στα σύνορα της Ελλάδας με την ΠΓΔΜ (ο Αυστριακός υπουργός έδωσε συνέντευξη στο κρατικό πρακτορείο ειδήσεων της ΠΓΔΜ, «MIA». Προειδοποίηση προς την ΠΓΔΜ ότι ο δρόμος της προς την Ευρωπαϊκή Ένωση και το NATO τίθεται εν αμφιβόλω απηύθυνε ο πρόεδρος του Ευρωπαϊκού Συμβουλίου Ντόναλντ Τουσκ, μετά τις τελευταίες πολιτικές εξελίξεις στη χώρα. Ξεκάθαρο μήνυμα προς τα Σκόπια, ότι χώρες που συμπεριφέρονται με αδιανόητες και απαράδεκτες συμπεριφορές προς τον ανθρωπισμό, όπως οι χθεσινές από πλευράς της γειτονικής χώρας προς του πρόσφυγες, δεν έχουν θέση ούτε στην Ευρωπαϊκή Ένωση, ούτε στο ΝΑΤΟ, έστειλε ο Πρόεδρος της Δημοκρατίας, Προκόπης Παυλόπουλος, κατά τη διάρκεια της συνάντησής, σήμερα το πρωί, με τον πρωθυπουργό της Πορτογαλίας, Αντόνιο Κόστα, στο Προεδρικό Μέγαρο. Χωρίς αποτέλεσμα για τη διεξαγωγή πρόωρων εκλογών στις 24 Απριλίου, όπως αρχικά είχε συμφωνηθεί, κατέληξαν τις πρώτες πρωινές ώρες οι συνομιλίες μεταξύ των αρχηγών των τεσσάρων μεγαλύτερων κομμάτων της ΠΓΔΜ. President Vladimir Putin on Thursday sent a letter to EU leaders, expressing his "extreme concern" over Ukraine's debt for Russian gas and warning them that supplies to Europe may be affected, his spokesman said. "Indeed, such a letter signed by Putin was today delivered to heads of state of Eastern and Western Europe through diplomatic channels," Putin's spokesman Dmitry Peskov told the state RIA Novosti news agency. "Putin expresses extreme concern over the critical situation around Ukraine's debt and supplies of Russian gas related to it," Peskov said. The letter, sent after a government meeting on Wednesday, contains a number of proposals on how to settle the situation, Peskov said. "The proposals are aimed at taking urgent measures, since (a solution to) the situation cannot be delayed," he said, declining to be more specific. The Interfax news agency, citing Peskov, said Putin had proposed "dialogue mechanisms to urgently discuss the situation." "The complicated situation indeed may negatively affect the transit of Russian gas via Ukraine," Peskov was quoted as saying. Putin on Wednesday warned that Russia may begin requiring advance payment for natural gas from Ukraine, which has accrued $2.2 billion in unpaid energy bills, according to Russian natural gas giant Gazprom. He added that it was "strange" that EU countries, while supporting the new authorities in Kiev "are doing nothing to support Ukraine." "This situation cannot last indefinitely," he has said. Earlier this month, Gazprom announced it was raising the price of gas exports to Ukraine by more than a third, scrapping a previous discount amid soaring political tensions between the two ex-Soviet countries. Ukraine now has to pay $485 dollars for 1,000 cubic metres of gas, the highest price of any of Gazprom's clients in Europe. End-of-the-year haggling over energy prices has become a familiar problem in ties between Russia and Ukraine, with Moscow cutting natural gas to Ukraine and disrupting transit supplies to Europe in the past. Ukraine maintains that Russia is punishing Ukraine for its Western ambitions and has threatened to take Moscow to court. 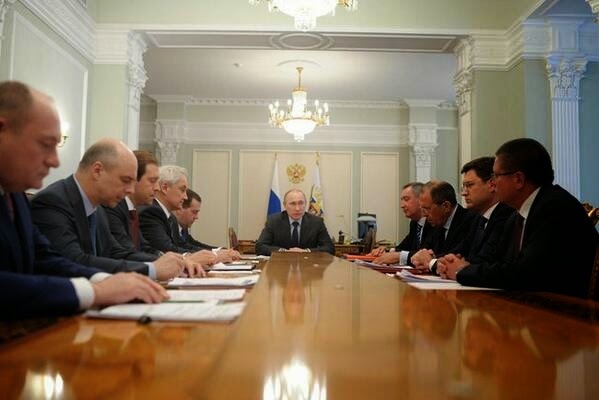 Instead of consultations, we hear appeals to lower contractual prices on Russian natural gas – prices which are allegedly of a “political” nature. One gets the impression that the European partners want to unilaterally blame Russia for the consequences of Ukraine’s economic crisis. Right from day one of Ukraine’s existence as an independent state, Russia has supported the stability of the Ukrainian economy by supplying it with natural gas at cut-rate prices. In January 2009, with the participation of the then-premier Yulia Tymoshenko, a purchase-and-sale contract on supplying natural gas for the period of 2009-2019 was signed. That contract regulated questions concerning the delivery of and payment for the product, and it also provided guarantees for its uninterrupted transit through the territory of Ukraine. 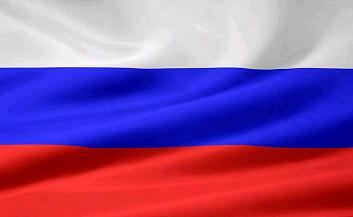 What is more, Russia has been fulfilling the contract according to the letter and spirit of the document. Incidentally, Ukrainian Minister of Fuel and Energy at that time was Yury Prodan, who today holds a similar post in Kiev’s government. The total volume of natural gas delivered to Ukraine as was stipulated in that contract during the period of 2009-2014 (first quarter) stands at 147.2 billion cubic meters. Here, I would like to emphasize that the price formula that had been set down in the contract had NOT been altered since that moment. 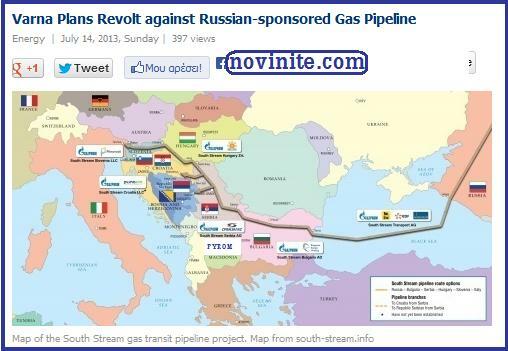 And Ukraine, right up till August 2013, made regular payments for the natural gas in accordance with that formula. However, the fact that after signing that contract, Russia granted Ukraine a whole string of unprecedented privileges and discounts on the price of natural gas is quite another matter. This applies to the discount stemming from the 2010 Kharkov Agreement, which was provided as advance payment for the future lease payments for the presence of the [Russian] Black Sea Fleet after 2017. This also refers to discounts on the prices for natural gas purchased by Ukraine’s chemical companies. This also concerns the discount granted in December 2013 for the duration of three months due to the critical state of Ukraine’s economy. 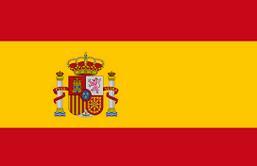 Beginning with 2009, the sum total of these discounts stands at 17 billion US dollars. To this, we should add another 18.4 billion US dollars incurred by the Ukrainian side as a minimal take-or-pay fine. In this manner, during the past four years Russia has been subsidizing Ukraine’s economy by offering slashed natural gas prices worth 35.4 billion US dollars. 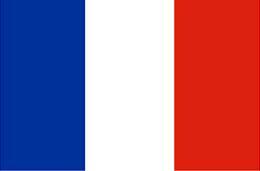 In addition, in December 2013, Russia granted Ukraine a loan of 3 billion US dollars. These very significant sums were directed towards maintaining the stability and creditability of the Ukrainian economy and preservation of jobs. No other country provided such support except Russia. 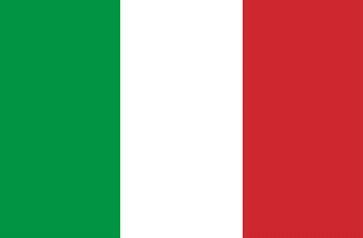 What about the European partners? Instead of offering Ukraine real support, there is talk about a declaration of intent. There are only promises that are not backed up by any real actions. The European Union is using Ukraine’s economy as a source of raw foodstuffs, metal and mineral resources, and at the same time, as a market for selling its highly-processed ready-made commodities (machine engineering and chemicals), thereby creating a deficit in Ukraine’s trade balance amounting to more than 10 billion US dollars. This comes to almost two-thirds of Ukraine’s overall deficit for 2013. To a large extent, the crisis in Ukraine’s economy has been precipitated by the unbalanced trade with the EU member states, and this, in turn has had a sharply negative impact on Ukraine’s fulfillment of its contractual obligations to pay for deliveries of natural gas supplied by Russia. Gazprom has no intentions except for those stipulated in the 2009 contract, nor does it plan to set any additional conditions. This also concerns the contractual price for natural gas, which is calculated in strict accordance with the agreed formula. However, Russia cannot and should not unilaterally bear the burden of supporting Ukraine’s economy by way of providing discounts and forgiving debts, and in fact, using these subsidies to cover Ukraine’s deficit in its trade with the EU member states. The debt of NAK Naftogaz Ukraine for delivered gas has been growing monthly this year. In November-December 2013 this debt stood at 1.451,5 billion US dollars; in February 2014 it increased by a further 260.3 million and in March by another 526.1 million US dollars. Here I would like to draw your attention to the fact that in March there was still a discount price applied, i.e., 268.5 US dollars per 1,000 cubic meters of gas. And even at that price, Ukraine did not pay a single dollar. In such conditions, in accordance with Articles 5.15, 5.8 and 5.3 of the contract, Gazprom is compelled to switch over to advance payment for gas deliveries, and in the event of further violation of the conditions of payment, will completely or partially cease gas deliveries. In other words, only the volume of natural gas will be delivered to Ukraine as was paid for one month in advance of delivery. Undoubtedly, this is an extreme measure. We fully realize that this increases the risk of siphoning off natural gas passing through Ukraine’s territory and heading to European consumers. We also realize that this may make it difficult for Ukraine to accumulate sufficient gas reserves for use in the autumn and winter period. In order to guarantee uninterrupted transit, it will be necessary, in the nearest future, to supply 11.5 billion cubic meters of gas that will be pumped into Ukraine’s underground storage facilities, and this will require a payment of about 5 billion US dollars. However, the fact that our European partners have unilaterally withdrawn from the concerted efforts to resolve the Ukrainian crisis, and even from holding consultations with the Russian side, leaves Russia no alternative. There can be only one way out of the situation that has developed. We believe it is vital to hold, without delay, consultations at the level of ministers of economics, finances and energy in order to work out concerted actions to stabilize Ukraine’s economy and to ensure delivery and transit of Russian natural gas in accordance with the terms and conditions set down in the contract. We must lose no time in beginning to coordinate concrete steps. It is towards this end that we appeal to our European partners. It goes without saying that Russia is prepared to participate in the effort to stabilize and restore Ukraine’s economy. 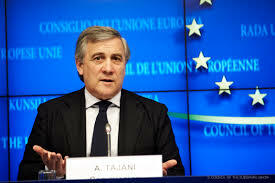 However, not in a unilateral way, but on equal conditions with our European partners. It is also essential to take into account the actual investments, contributions and expenditures that Russia has shouldered by itself alone for such a long time in supporting Ukraine. As we see it, only such an approach would be fair and balanced, and only such an approach can lead to success. Gazprom launches South Stream construction in Bulgaria - Miller. The CEO of Russian energy giant Gazprom Alexey Miller announced on Thursday the start of the 2,380-kilometre South Stream gas pipeline project in Bulgaria. "Today we are launching the construction of the Bulgarian section of the South Stream gas pipeline," Miller said after talks with Bulgarian Prime Minister Plamen Oresharski. Miller and Oresharski watched the beginning of the construction works near the village of Rasovo in north-western Bulgaria on monitors in the Council of Ministers in Sofia. 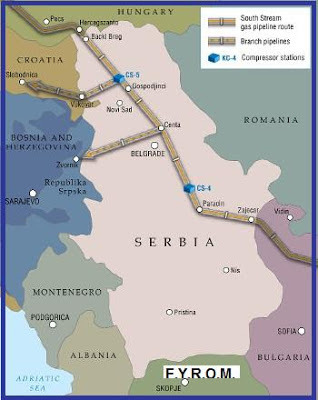 Miller said the South Stream pipeline was the most important part of Europe's energy security as supplies would go directly through Bulgaria to the European Union, adding that 3.5 billion euros would be invested in Bulgaria. 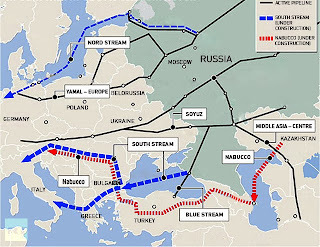 Gazprom is using South Stream to deliver Russian gas to Central and Eastern Europe, bypassing the Ukraine in order to avoid gas crises similar to the supply stoppage in the beginning of 2009 when Russia and the Ukraine squabbled over gas policies. 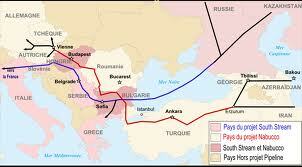 Consumers will be receiving the first South Stream gas in December 2015, he said. The construction of the Serbian section of the pipeline is to start by the end of this year. South Stream: Varna Plans Revolt against Russian-sponsored Gas Pipeline. The environmental impact of the pipeline. Έτινγκερ: Ο South Stream δεν θα χρηματοδοτηθεί από την ΕΕ. -Δεν μας δίνει πρόσβαση σε καμία νέα πηγή ενέργειας και δεν αυξάνει την ανταγωνιστικότητα της αγοράς ενέργειας στην Ευρωπαϊκή Ένωση. “Then it turned out we were having a match from what you could call the Bulgarian nation’s domestic league,” he explained. 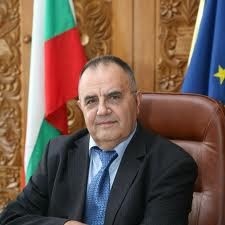 According to him, the Bulgarian nation is currently divided by a frontier. 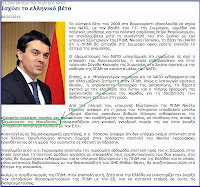 Mr Dimitrov is also interested in the reaction of a group of Macedonian fans of FYROM, called “Komitite”. He describes them as a pro-Serbian group that often attacks Bulgarians gathered to commemorate revolutionary Mara Buneva. Контроверзниот историчар и директорот на Бугарскиот музеј за национална историја, Божидар Димитров, во интервју за Бугарската новинска агенција „Фокус“ го нарече вечерашниот пријателски меч на фудбалските репрезентации на FYROM и Бугарија „натпревар во домашна лига на бугарската нација“. (map after the necessary correction with the name "FYROM". Ο πρωθυπουργός της ΠΓΔΜ Νίκολα Γκρούεφσκι δήλωσε ότι την Τρίτη θα πραγματοποιηθεί στη Μόσχα η υπογραφή συμφωνίας για τη συμμετοχή της χώρας στον αγωγό φυσικού αερίου «South Stream». Ο κ.Γκρούεφσκι συμπλήρωσε ότι κυβερνητική αντιπροσωπεία της χώρας, με επικεφαλής τον ίδιο, θα μεταβεί στη Μόσχα, για την υπογραφή συμφωνίας, κατόπιν πρόσκλησης από τη ρωσική κυβέρνηση. Σε ερώτηση από ποιο σημείο θα εισέρχεται στην ΠΓΔΜ η διακλάδωση του αγωγού «South Stream» (Σερβία ή Βουλγαρία), ο κ.Γκρούεφσκι ανέφερε ότι αυτό θα αποφασιστεί από την ρωσική πλευρά και πιο συγκεκριμένα από την «Γκαζπρόμ». Η συμφωνία με τη ρωσική πλευρά για την κατασκευή διακλάδωσης του αγωγού φυσικού αερίου South Stream προς την ΠΓΔΜ έχει αναγγελθεί αρκετές φορές μέχρι σήμερα από την μεριά της κυβέρνησης της ΠΓΔΜ, όμως αναβαλλόταν συνέχεια. Για την ώρα δεν είναι σαφές τι είδους συμφωνία θα υπογράψουν την Τρίτη η Ρωσία και η ΠΓΔΜ. Πριν δύο εβδομάδες η ρωσική κυβέρνηση είχε ανακοινώσει ότι ενέκρινε σχέδιο συνεργασίας μεταξύ Ρωσίας και ΠΓΔΜ για τη συμμετοχή της ΠΓΔΜ στον αγωγό φυσικού αερίου South Stream και την προμήθεια ρωσικού φυσικού αερίου προς αυτήν. Τα ρωσικά υπουργεία Εξωτερικών και Ενέργειας εξουσιοδοτήθηκαν από τον Ρώσο πρωθυπουργό Νμίτρι Μεντβέντεφ να ξεκινήσουν συνομιλίες με την κυβέρνηση της ΠΓΔΜ για το σχέδιο συμφωνίας. Εφόσον αυτό εγκριθεί, θα συνταχθεί μελέτη σκοπιμότητας και θα προσδιοριστούν η διαδρομή της διακλάδωσης, το σημείο εισόδου της στη χώρα και η δυναμικότητά της διακλάδωσης. Εφόσον επιβεβαιωθεί ότι η διακλάδωση προς την ΠΓΔΜ είναι οικονομικά βιώσιμη, η ρωσική Γκαζπρόμ και η κρατική εταιρία της ΠΓΔΜ «Ενεργειακοί Πόροι» θα ιδρύουν κοινοπραξία για την υλοποίηση του σχεδίου της διακλάδωσης του αγωγού με ίση συμμετοχή των μετόχων (από 50%). Αν τελικά προχωρήσουν όλα τα παραπάνω, η ρωσική πλευρά θα διατηρήσει δικαίωμα πλήρους χρήσης της δυναμικότητας της διακλάδωσης. 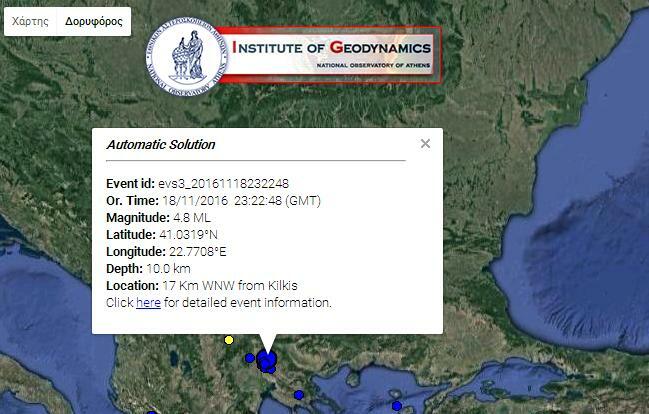 Η κοινοπραξία θα είναι επίσης διαχειριστής και θα καθορίζει τις τιμές του φυσικού αερίου που θα εξάγονται στην ΠΓΔΜ, η οποία θα πρέπει να εγκρίνει τα σχετιζόμενα με τη διακλάδωση έργα αποδίδοντάς τους καθεστώς εθνικού σχεδίου. 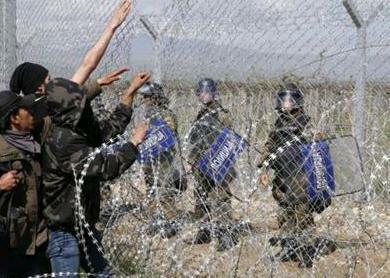 Η συμφωνία θα έχει ισχύ 30 ετών με δικαίωμα επέκτασης ανά πενταετία. 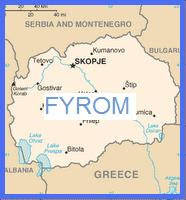 *(Gazprom's map after the necessary correction with the name "FYROM". Residents of Bulgaria's Black Sea city of Varna are preparing to stage a protest rally against the joint Russian-Bulgarian South Stream natural gas pipeline project.They have prepared 9 questions to Russian gas giant Gazprom's CEO Alexey Miller regarding the environmental impact of the pipeline. Varna people, whose houses are just 2 km away from the pipeline and will be directly affected by it, have sent an open letter with the questions. They say they are ready for civil unrest and are expecting the reaction and the opinion of Ivan Portnih, the newly-elected Mayor of Varna, who ran on the ticket of the formerly-ruling Citizens for European Development of Bulgaria party, GERB.On July 8, Miller was in Bulgaria for talks with Prime Minister, Plamen Oresharski, and the Minister of Economy and Energy, Dragomir Stoynev.Miller explained then that the first volume will reach Bulgaria in December 2015 and Gazprom will invest EUR 3.1 B for the Bulgarian section with plans to include many Bulgarian companies in the works.Stoynev assured Russia that the South Stream gas pipeline remains a project of strategic importance for Bulgaria.On Tuesday, July 16, the management of the project company South Stream is arriving in Varna to lead a direct dialogue with citizens and present the environmental impact assessment report in an attempt to convince them the gas industry is clean and ecologically safe.The listed advantages include new job openings (at least 2 500) in Varna, where the unemployment rate is at record high despite the summer season; increased and stable profits for the port of Varna of at least EUR 30 M initially, compensations for land owners, investments in satellite industries, and additional profits and local business boom over the hundreds of engineers and construction workers expected to arrive in the city to work on the project.Russia says Bulgaria will not have to shell taxpayers' money for the pipeline.However, the entire gas pipeline is expected to cost a minimum of EUR 16 B, of which the EUR 3 B for Bulgaria, pledged by Miller, are actually a loan from Russia. The loan will be repaid by Bulgaria giving up on transit fees for 15 years.In April, Bulgaria's caretaker Prime Minister, Marin Raykov called for a new and more in-depth analysis of the project.The South Stream pipeline is intended to transport up to 63 billion cubic meters of natural gas to central and southern Europe, diversifying Russian gas routes away from transit countries such as Ukraine. 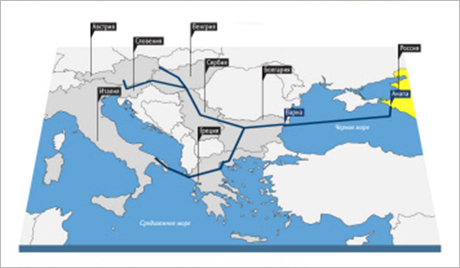 Construction started in December 2012 in Russia.The pipes will go from Russia to Bulgaria via the Black Sea; in Bulgaria it will split in two – with the northern leg going through Serbia, Croatia, Hungary, and Slovenia to Austria and Northern Italy, and the southern leg going through Greece to Southern Italy.The Black Sea underwater section of South Stream between Russia and Bulgaria will be 900 km long, and will be constructed at a maximum depth of 2 km.The pipeline's core shareholders include Gazprom with 50%, Italy's Eni with 20% and Germany's Wintershall Holding and France's EDF with 15% each.Gazprom has already established national joint ventures with companies from Austria, Bulgaria, Croatia, Slovenia, Greece, Hungary and Serbia to manage the onshore section of the South Stream pipeline.The pipeline is expected to carry the first gas supplies before 2015 and reach full capacity in 2018, providing 10% of European gas supplies.A number of experts have already questioned the profitability of the pipeline on the backdrop of increasing competition and reduced interest in Russian gas supplies in Europe. 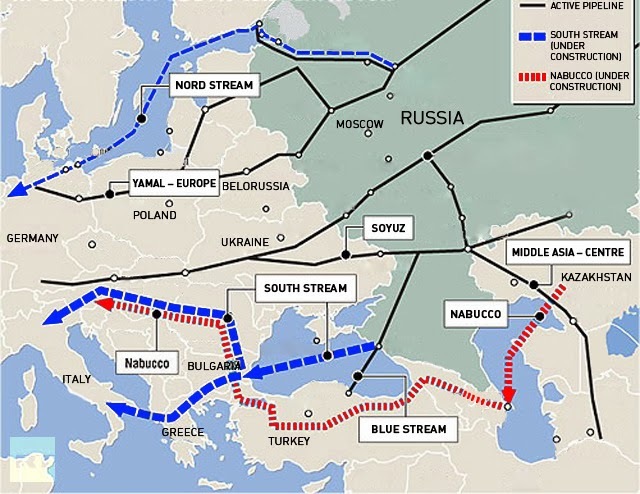 Some also add Russia's attempt to circumvent the Ukraine at all costs makes South Stream more of a political than a business project. Στην πρώτη περίπτωση, σε αρκετές ελληνικές ιστοσελίδες, επαναλαμβάνεται το παράδοξο "φαινόμενο" να μεταφέρουν δηλώσεις σκοπιανών αξιωματούχων διατηρώντας τον όρο “Δημοκρατία της Μακεδονίας”. Το πώς αποκαλούν την χώρα τους σκοπιανοί πολιτικοί, δημοσιογράφοι και πολίτες το γνωρίζουμε όλοι και πολύ καλά. Δεν χρησιμεύει σε τίποτα να το υπενθυμίζουμε. Το να το μεταφέρουμε όμως, με οποιονδήποτε τρόπο, στα δικά μας γραπτά δείχνει ότι δεν μας ενοχλεί και τόσο ή δεν το δίνουμε και τόση σημασία. Συγκεκριμένα, η δήλωση του σκοπιανού ΥΠΕΞ μπορεί να μεταφερθεί με πολλούς τρόπους. Είναι θέμα αντανακλαστικών σε εθνικά θέματα, όπως δήλωσε πρόσφατα και ο Έλληνας ΥΠΕΞ, κατά την επίσκεψή του στην Κύπρο. Προφανές είναι, ότι σε τέτοιου είδους λεπτά θέματα, δεν είναι αρκετά μόνο τα αντανακλαστικά των πολιτικών μιας χώρας, αλλά και των πολιτών της. Επί πλέον, δεν πρέπει να αφήνετε χώρος για ακραίες συμπεριφορές. 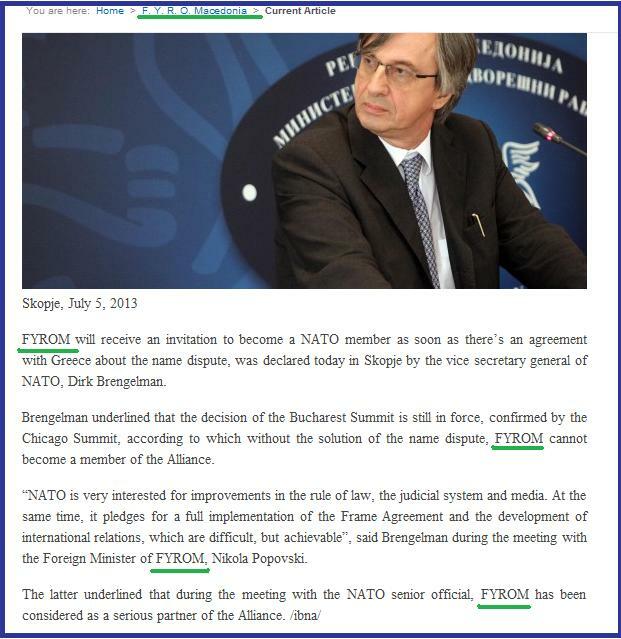 Στην δεύτερη φωτογραφία, από το balkaneu.com, παραβλέποντας το φόντο της φωτογραφίας, παρατηρούμε την προσεκτική χρήση του όρου FYROM του αρθρογράφου Naser Pajaziti. Σε αντίθεση με Έλληνες αρθρογράφους, που ηδονίζονται να χρησιμοποιούν ολόκληρο το "πρώην Γιουγκοσλαβική Δημοκρατία της Μακεδονίας" αντί του πΓΔΜ, επαναλαμβάνει τον όρο FYROM. Τι να προσφέρει ολόκληρος ο όρος αφού όλοι γνωρίζουμε ποια είναι η πΓΔΜ. Ξαναγυρίζοντας στην δήλωση του Έλληνα ΥΠΕΞ και αντιπροέδρου της κυβέρνησης, κ. Ευάγγελου Βενιζέλου, στην Κύπρο, ότι η κρίση δεν θα κάμψει τα αντανακλαστικά μας στα εθνικά θέματα, θα παρατηρήσουμε ότι αυτά μπορεί και να είναι σε κατάσταση ατονίας εδώ και αρκετά χρόνια. Το άρθρο της πρώτης φωτογραφίας όταν το βλέπει κανείς σε οποιοδήποτε site, που απλά αντιγράφει κεντρικό ελληνικό πρακτορείο ειδήσεων, δεν ξενίζει. Όταν όμως το βλέπει σε site που διαχειρίζεται νέο μέλος του Ελληνικού Κοινοβουλίου, αναρωτιέται, πόσο άτυχη είναι αυτή η χώρα. Αποδεικνύεται ότι το νέο είναι ακόμα χειρότερο από το παλιό. ****Μερικοί αρθρογράφοι διόρθωσαν το άρθρο του κεντρικού ελληνικού πρακτορείου με τον όρο "η χώρα του". Η κυβέρνηση της ΠΓΔΜ είχε αναγγείλει ότι η υπογραφή της συμφωνίας αυτής θα γινόταν στο περιθώριο του διεθνούς οικονομικού φόρουμ στην Αγία Πετρούπολη το οποίο ολοκληρώθηκε, χωρίς οι δύο χώρες να υπογράψουν συμφωνία. A recent report reveals the millions of euro paid in fees to the sculptors involved in the revamp of the capital called "Skopje 2014". For the first time since the launch of the project, the government on Monday presented an official financial report, which confirmed rumours of the hefty fees paid to the sculptors. Valentina Stevanovska, author of some of the main statues that form part of the project, including the equestrian statue of Alexander the Great, one of his father, Philip, as well as a triumphal arch, earned 2.9 million euro in fees, the report showed. Like many of her colleagues involved in the project, Stevanovska was a complete unknown before being awarded commissions to design the grand statues. For the 24-metre-high Alexander statue on Skopje’s central square, Stevanovska earned 649,000 euro while for another square dominated by the statue of Philip and his wife, Olympia, she earned 1.4 million euro. The authors of other monuments do not come close to Stevanovska in terms of earnings, but some have obtained serious sums. Tome Adjievski got 130,000 euro for a massive “Monument of Macedonian Ancient Greek Heroes”. His colleague, Mile Brceski, earned 114,991 euro for the equestrian statue of the Ottoman-era revolutionary, Todor Aleksandrov. Zarko Baseski was paid 113,000 euros for sculpting three monuments of "Bulgarian" revolutionaries and Christian saints. About 100,000 euros went to Zoran Kostovski for the monument called “Macedonia” while Grozdanka Kanikova got 97,000 euro for three smaller sculptures, called “Girl”, “Fish” and “The Observer”. Drawing inspiration from the architectural styles of Classical antiquity, the project has seen the erection of some 30 tall bronze and marble statues so far, with more on the way. The project also envisages the construction of some 20 other buildings, including museums, theatres, concert halls, hotels and administrative offices whose construction in most cases is finished or underway. Since it was unveiled, the project has attracted much criticism about the selected artistic styles, the cost of the work and the transparency of the contracts given to the architects and designers. According to the government report, the total cost of the project so far is 208 million euros, but the opposition and critics say that the real value could be from half to one billion euros. Suspecting financial crime, On Thursday, the newly elected mayor of Skopje’s municipality of Centar, Andrej Zernovski, home of the controversial revamp, ordered halt to all works related to the project and announced a revision of the work of his predecessor Vladimir Todorovic. During Todorovic’s term the municipality played an important role in the distribution of government money for the revamp. The municipality was particularly in charge for the construction of monuments. Η συμφωνία για τη συμμετοχή της ΠΓΔΜ στον αγωγό φυσικού αερίου South Stream πέρασε την τελική έγκριση και είναι έτοιμη για επικύρωση, δήλωσε σήμερα Πέμπτη στους δημοσιογράφους ο αντιπρόεδρος της κυβέρνησης και υπουργός Οικονομικών της χώρας Ζόραν Σταβρέσκι. Η έναρξη της προετοιμασίας της ένταξης της ΠΓΔΜ στο έργο του «Νότιου Ρεύματος» είχα ανακοινωθεί τον Ιούλιο του 2012. Η ρωσική ενεργειακή εταιρεία Γκαζπρόμ υλοποιεί το έργο του αγωγού φυσικού αερίου South Stream με σκοπό τη διαφοροποίηση των διαδρομών εξαγωγής του φυσικού αερίου. The UN mediator in the FYROM-Greece ‘name’ talks, Matthew Nimetz, is visiting Athens and Skopje, bringing fresh proposals for a solution to the dispute. Officials in Athens and Skopje expect the UN mediator in the longstanding dispute over FYROM's name - to which Greece objects - to put forward some fresh ideas. 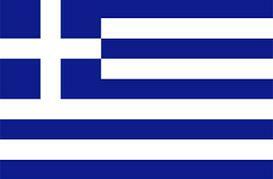 Prior to Nimetz’s arrival in Greece, the Greek Foreign Minister, Dimitris Avramopoulos, said his country aimed for a solution that would respect each side's history and culture and strengthen regional stability and security. “Nimetz’s visit... is a development that we wanted, to the extent that it can create the conditions for progress on the 'name' issue,” he said. After meeting Greek officials, Nimetz is expected to go on to Skopje. "I hope for new initiatives and ideas [from Nimetz],” the FYROM's President, Gjorge Ivanov, said before the New Year's holiday. 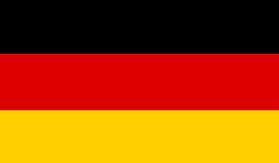 Media in both countries report that Nimetz is indeed bringing specific proposals, involving a composite name with geographical qualifier. 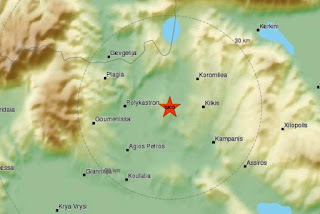 This might concern the use of the terms "Northern", or "Vardar", placed before "Republic of Maredonia". Nimetz’s fresh push follows the recent conclusion of the EU Council, which said that any decision on opening accession talks for FYROM would be based on the report of the European Commission to be published in spring 2013. 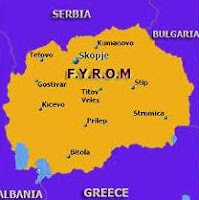 The report will assess whether FYROM has made genuine steps forward towards reaching a deal with Greece on its name. 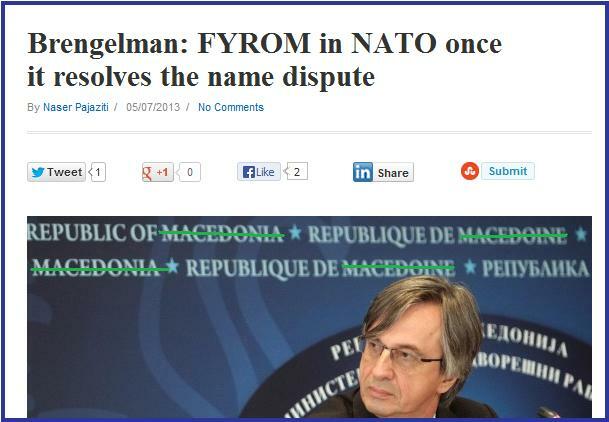 Greece insists that FYROM’s name implies territorial claims to its own northern province, called Macedonia. 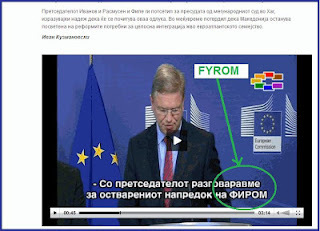 FYROM has obtained annual recommendations for a start to EU membership talks in European Commission reports since 2009. 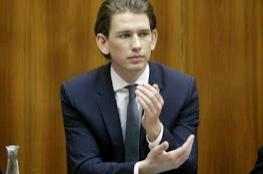 But it has never been offered a date for the talks "owing" to the Greek "blockade" related to the dispute over its name. Ύστερα από μαραθώνιες συνομιλίες, "Γκαζπρόμ"(GAZPROM) και Βουλγαρία υπέγραψαν σήμερα στη Σόφια πρωτόκολλο για την τελική επενδυτική απόφαση σχετικά με την κατασκευή και διέλευση του αγωγού φυσικού αερίου South Stream στο βουλγαρικό έδαφος. Στην υπογραφή της συμφωνίας η "Γκαζπρόμ" εκπροσωπήθηκε από τον επικεφαλής της Αλεξέι Μίλερ. Μέτα και από την σημερινή εξέλιξη ανοίγει ο δρόμος για την έναρξη των εργασιών κατασκευής του αγωγού, οι οποίες σύμφωνα με πρόσφατη ανακοίνωση της εταιρείας θα ξεκινήσουν σε λιγότερο από τρεις εβδομάδες από σήμερα.